Earlier this year, our saviors of a different space and time Deltron 3030 finally dropped the long-awaited sequel to their self-titled turn-of-the-century album. 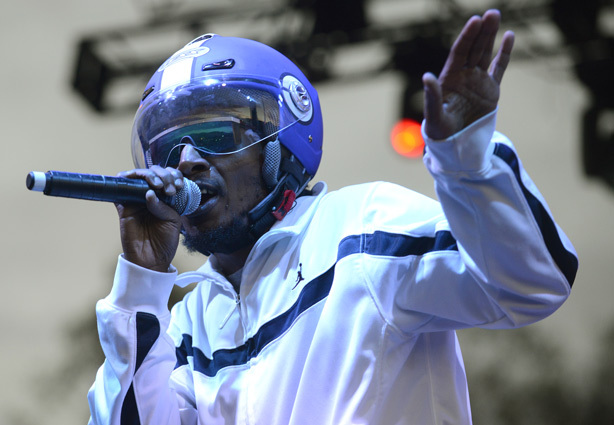 In the works for almost a decade, Event II proved to be a worthy second endeavor for the trio of Del the Funky Homosapien, Dan the Automator, and Kid Koala. The album is surpassingly entertaining, and the list is studded with a slew of unexpected stars. Joseph Gordon-Levitt, David Cross, Mike Patton, Mary Elizabeth Winstead, The Lonely Island, Damon Albarn, and Zack De La Rocha alone make up only half that list. It’s the rather dire De La Rocha-featuring cut that has received video treatment. The Justin Lee-directed video for “Melding of the Minds” stars a little red-headed, Powerpuff Banksy of the future rather than our heroes Deltron 0 and Automator, but it maintains the persistent peril the song’s production projects. Scampering about the city and avoiding smiling, shapeless monstrosities as she prepares her masterpiece, our new, nameless, and unheralded heroine steals our hearts before an unexpected and affecting ending. Darn you, Deltron. You delighted us with your unparalleled nerdiness on the album. Now you’re making us feel things. Check out the Esquire-premiered video after the jump.